Guardian Pharmacy of Maine is Maine’s largest privately-owned long term care pharmacy. 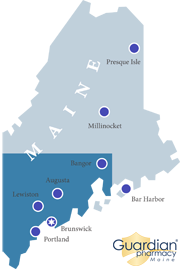 We are located 30 minutes north of Portland (Maine’s largest city) and 15 minutes from the Maine coast. Guardian Pharmacy of Maine is a locally managed pharmacy and a member of Guardian Pharmacy Services. Guardian Pharmacy of Maine offers a challenging and diversified work environment. We have a range of full-time and part-time employment opportunities — pharmacists, pharmacy technicians, billing specialists, delivery drivers etc. Candidates without pharmacy experience who have demonstrated an ability to quickly learn will be given every consideration when they apply for an entry level position (for example, Daily Fill Technician).